I have discovered a new show. Well, not new-new, just new to me. 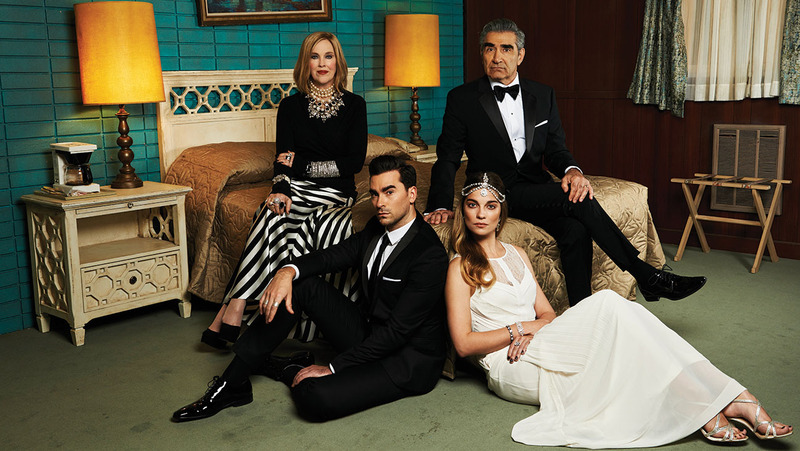 It's a Canadian sitcom that debuted in January 2015 and it's called Schitt's Creek. I remember seeing the promos and thinking, "That looks dumb." Oh, how wrong I was. It's comedy gold. The series was created by Eugene Levy and his son, Daniel Levy. Most people are familiar with Eugene Levy and his body of work, and even if you haven't seen his movies, you probably recognize him once you see his face. "The series stars Eugene Levy as Johnny Rose, a wealthy video store magnate, and Catherine O'Hara as his wife Moira, a formerly successful soap star. The family loses their fortune when their business manager fails to pay their taxes. They are forced to rebuild their lives with their sole remaining asset: a small town named Schitt's Creek which they had bought their son as a joke birthday gift years before. The story revolves around the family's life living in two adjacent rooms of a rundown motel with their pampered twenty-something adult children, David and Alexis, played by Daniel Levy and Annie Murphy respectively. Additional cast includes Chris Elliott, Jennifer Robertson, Emily Hampshire, and Eugene Levy's daughter and Daniel's sister, Sarah Levy. 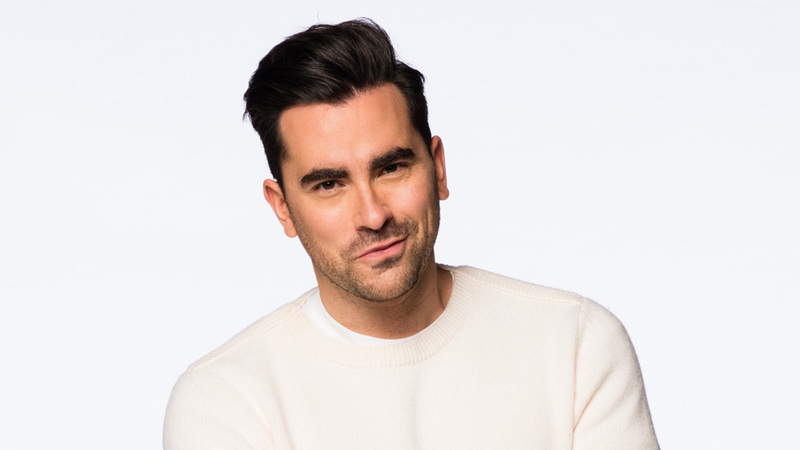 The show is based on a series of situations contrasting the once-rich family and their worldly big-city attitudes with sudden small-town living and the honest, down-to-earth, hard-working residents of Schitt's Creek." I am completely obsessed with Daniel Levy (David). Not only is he insanely handsome, but his facial expressions and comedic timing make the character. Ed and I binge-watched the first three seasons and all of Season 4 up to the current episode. It's hard to pick a favorite episode (You Get Murdered First tops my list) but since I just watched Season 4, the one where David finds himself really falling in love for the first time sticks in my mind. Probably because there's a musical number. I love these kinds of shows - funny and uplifting, with great writing and characters you can really start to love. But another aspect of this show that I really love, is the fashion. Catherine O'Hara is outstanding, with her quirky manner of speech, the parade of wigs, and a wardrobe inspired in part by a photo of Daphne Guinness that O'Hara brought with her to one of the first meetings for the show. I love that I'm caught up on the series, but after binge-watching so many episodes, it's a real letdown when there's nothing left and you have to wait for the regular show to air. I know better, as I've done this before with other shows. I should have spaced them out and savored each one a little bit longer. I can't wait for the next episode. In the meantime, I'm going to Google everything I can about the show, it's cast, the filming location (Canada). And I'm going to find pictures of Daniel Levy to use as the screensaver on my phone, iPad, and computer. 2012: Sign Of Spring2011: ¡Buen Provecho! Yes, yes, yes...Daniel levy is the best!